Groundcovers and other low-growing landscape plants form an indispensable part of a yard's design, whether as backdrops for trees and taller shrubs, as specimens in their own right, or as problem solvers in areas where it is tough to grow anything. This page serves as a handy index to resources that focus largely on low-growing plants, such as creeping shrubs, perennial flowers, annuals, and vines. Steep slopes are a beast to mow, assuming that you have had any luck in getting grass to grow on them, at all. If these problems sound familiar, then let me tell you about the landscape plants that may hold the answer for you: sun-loving juniper groundcovers, including Blue Rug juniper. Groundcovers offer landscape solutions for problem areas, including areas pounded by the sun or plagued by the shade. But overly sunny or shady areas are not your only challenge. When deer pests come to snack on your groundcovers, you need to refine your landscape solution strategy. Discover which groundcovers are effective in deer control -- plants that deer pests generally will not eat. And these deer-resistant groundcovers have many other fine qualities that will give you plenty of reasons to grow them. Perennial Butterfly Gardens: Butterfly Weed, Etc. But maybe you do not have a "problem" to solve. Maybe you are looking for perennial flowers that will attract butterflies and beneficial pollinating bees? Then this is the article for you. Both short and taller specimens are covered. The list is headed by butterfly weed. But other perennials are discussed, too, as well as shrubs and other classes of plants. This article introduces several perennials known to attract hummingbirds. Learn about bee balm, red columbine, delphinium, hollyhock, and other plants (including two shrubs and a tree, just for some variety). English lavender is an example of a wonderfully aromatic plant. Uses for it include in rock gardens, border plantings and cottage gardens. If your design needs call for a decorative border, lavender’s height makes it suitable for inclusion in the middle row, with shorter annuals in front and taller shrubs in back. 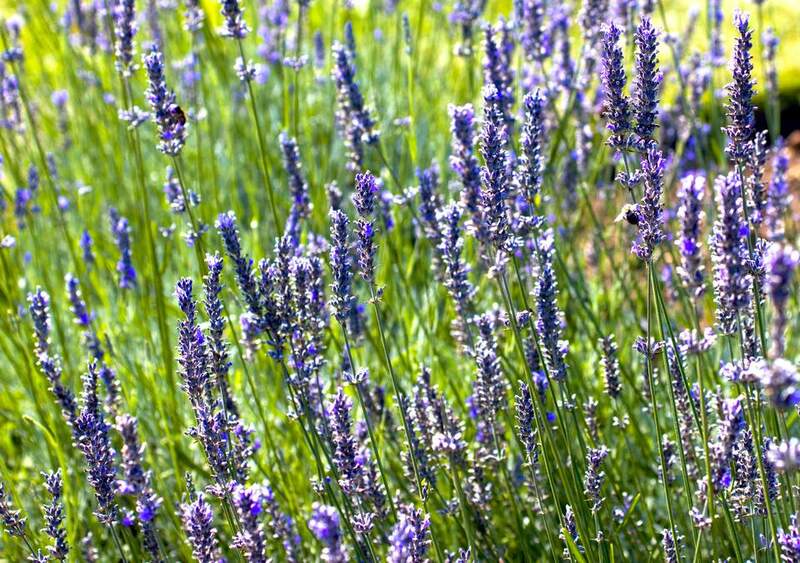 With lavender, you can harvest your perennial flowers for sachets and aromatherapy. Of course, lavender does not have a monopoly on great fragrance. We usually think of fragrant flowers when mention is made of plant smells, but there are also plants valued for their aromatic foliage. But perhaps you enjoy the easy, consistent, inexpensive color that only annual landscape plants can bring to a yard? They are great as summertime bedding plants in the North and for filling holes created by the petering out of early-season plants. But even in the chilly North, their value can extend beyond the summer season. This story tells you how to have a knockout fall garden of annuals -- on the cheap. No assessment of options for low-growing plants is complete without a look at vines. Not that our experience with all vines necessarily comes from looking down at them; indeed, we are used to seeing some vines (for example, the inaptly named Virginia creeper, which I prefer to think of as "Virginia climber") high up in the tree-tops. Still, even the most vigorous climbing vines can reach a significant height only if they have something else upon which to climb. What would fall be without a bittersweet wreath hanging on your door? Then why not grow your own? It can be so satisfying when your landscaping projects and craft projects intersect. Problem is, you really need to get your hands on the right kind of bittersweet. If you live in North America, you will want to grow American bittersweet; the Oriental type is terribly invasive. My article begins by introducing the different kinds of bittersweet, as three different plants vie for the right to be called by that name. Warning: The project described in this tutorial may be addictive. There is something about these plants that gets into the bloodstreams of some people and drives them "out of their gourds." How else can you account for the existence (I do not jest) of "gourd societies?" Did you know that at the annual get-together in Ohio put on by the American Gourd Society, there is actually a contest to see who can make the best gourd hat? In fact, hardshell gourds can become addictive on two levels: both growing them and using them in crafts. If you have ever pushed a lawn mower around on a hot day, deafened by the engine's roar yet hoping it won't conk out, you have probably wondered, "Is there another way?" Well, yes, there is. Who says that x amount of square yards on your property must be planted with grass, instead of with groundcovers and other landscaping plants that you do not have to mow every week? Creeping thyme is one of my favorite lawn alternatives. Establishing flower beds consisting mainly of perennials along a fence, house foundation, etc. is a terrific way to bring joyous color to one's yard. But the key to doing it well is understanding sequence of bloom and the importance of mastering it in your plant selection. I start you off on the right foot in this article by giving you some ideas for flower-bed options that will shine at different times of the growing season, so that your yard will be the envy of the neighborhood throughout spring, summer, and fall.